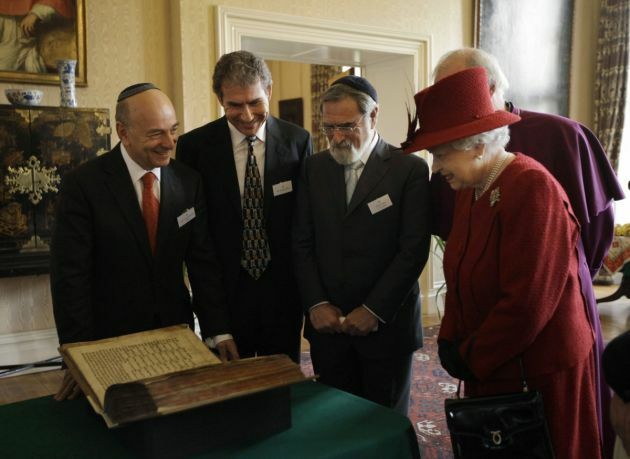 (Photo: REUTERS / Matt Dunham / pool)Britain's Queen Elizabeth is shown the Codex Valmadonna I book by Jewish guests, (L-R) President of the Board of Deputies of British Jews, Vivian Wineman, Chairman of Ostro Minerals Schweiz AG, Maurice Ostro and Chief Rabbi of the United Hebrew Congregations of the Commonwealth, Jonathan Sacks during a multi-faith reception to mark the Queen's Diamond Jubilee at Lambeth Palace in London February 15, 2012. Britain's Chief Rabbi, Lord Jonathan Sacks has said the growth of individualism over the past 50 years is responsible for a pervasive breakdown in trust in institutions such as marriage. "When trust breaks down, you see institutions break down," Sack said in an interview with BBC Radio 4's Sunday programme. Sacks who is 65 is to step down in September after 22 years in his post and has conducted a number of interviews with the British media and has spoken about issues including the persecution of Christians in the Middle East. He will be succeeded by Rabbi Ephraim Mirvis, an ex-chief rabbi of Ireland. Sacks noted a link between the 2008 financial crisis and the declining marriage rate in his interview with the UK's national broadcaster. He said: "I think we're losing the plot actually. I think we haven't really noticed what's happened in Britain." He added: "If people work for the maximum possible benefit for themselves then we will not have trust in industry, in economics, in financial institutions, we will not see marriages last." Sacks also said institutions, including marriage, break down "when you begin to lose faith and society becomes very, very secularised". "It's not the fault of one government or another, and it's not even the fault of government," he said. "It's the fault of what we call culture, which is society talking to itself." Lord Sacks has been chief rabbi of the UK and Commonwealth since 1991. The role is traditionally seen as the figurehead of British Jews, although it is only officially representative of the United Synagogue, the biggest wing of orthodox Judaism in the UK. The chief rabbi does not officially represent other branches of Judaism. The breakdown of marriage is among this chief concerns. Sacks and his wife, Elaine, 64, who is a radiographer married in their early twenties and Lady Sacks. The couple have three children and seven grandchildren. He argued in the BBC interview that the breakdown of marriage had exacerbated child poverty in the UK, "so children get to be the victims." Sacks said he had no desire to be "prescriptive" about potential solutions, but suggested, "I think a situation where children grow up in stable association with the parents who bought them into being is probably the biggest influence on the eventual shape of a society." The Chief Rabbi called on all political parties to work more with faith communities on "how can we educate people for a sense of the importance of enduring relationships". He said: "If you're looking for Big Society, it's strongest in those church or mosque or temple communities, or synagogue communities, because that's what we do. We care for one another." In a separate interview with the Telegraph newspaper on Sunday Sacks said, "I used every opportunity I had in broadcasting, in writing I was doing for the press, and internally within the Jewish community, to strengthen marriage." He believes the UK government is not doing enough for marriage, and says that marriage should be recognised in the tax system. The Chief Rabbi dates the decline of the institution to the 1960s and a generation which failed to hand on their own values to their children. "It seems to me that the breakdown of marriage seemed like a tremendous liberation. We were there in that revolution and at the time it seemed to be 'all you need is love' and nothing else. "We live to see, 50 years later, the full cost of that, of an entirely new kind of child poverty that has a lot to do with single parent families. "No one wants to lay a burden of guilt on anyone who bought into the cultural attitudes of the 60s but the fact is their kids are suffering." He told the BBC, religious faith "undergirds trust as a whole in society" but is misunderstood by many people, he said, to mean "something I believe without evidence". "It doesn't mean that at all," he continued. "Faith, at least Jewish faith, means having trust in one another, and that trust being based on trust in God." In an article for the Times newspaper, Lord Sacks recently urged ministers to do more to encourage marriage and support stay-at-home mothers.